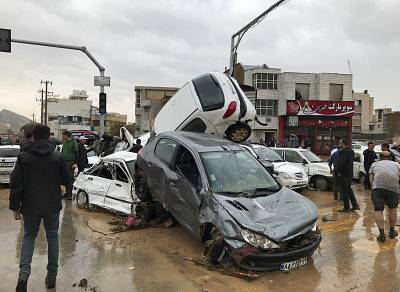 DUBAI - At least 18 people were killed and around 100 others were wounded in flash floods in Iran's southern province of Fars, Iran's semi-official Tasnim news agency reported on Monday, following devastating floods in the north.State TV said several provinces were also on high alert for more imminent flooding because of heavy rain. The meteorology department warned people about rain forecast for the coming days, state radio reported, urging them to avoid any trips.As the victims of the northern Iran flood struggled with the water and mud, President Hassan Rouhani's hardline rivals have criticized his government for doing too little, too late.Iran's hardline judiciary said on Sunday the government's handling of the disaster was being investigated, the judiciary's Mizan news agency reported. "Any shortcomings regarding the handling of the floods, failure to provide relief and aid to the survivors will be investigated," it quoted judiciary chief Ebrahim Raisi as saying.Hardline cleric Raisi lost the 2017 presidential election, when Rouhani was re-elected.The semi-official Fars news agency reported on Monday that Rouhani has returned to Tehran from Iran's Qeshm Island in the Gulf, where he had been spending the Iranian new year holiday.He was criticized by Iranians on social media for being in the south when flooding was hitting the north of the country. In a rare move, Iran's top authority, Supreme Leader Ayatollah Ali Khamenei, called on the armed forces to help the flood-hit northern provinces.Iran's hardline media have accused the government reacting too slowly to the floods, while highlighting aid work by the Revolutionary Guards - a rival power center in Iran's faction-ridden political establishment.Vice President Eshaq Jahangiri fired the governor of Golestan province, according to Tasnim, for not cutting short his trip abroad during the floods.The spread of flooding to the south follows days of floods that affected more than 56,000 people living in 270 villages and small towns in the northern provinces of Golestan and Mazandaran, on the Caspian Sea, since March 19, TV reported.In Shiraz, in the south, Tasnim quoted the head of Iran's emergency medical services, Pirhossein Kolivand, as saying 18 people had been killing, including four children. 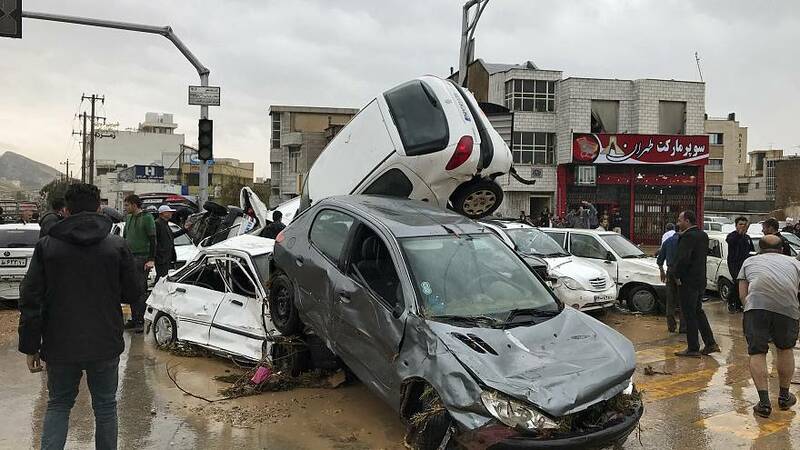 Some 94 were injured in the city in Fars province.TV aired footage of cars caught in flood waters in Shiraz. Iran's Students News Agency ISNA said high water had damaged thousands of houses in Shiraz and other towns. "We all are going to die. Pray for us. We are all going to die. Mother, we all are going to die," said a woman in a bus caught in the floods in Shiraz, according to a video posted on Twitter.Fars Governor Enayatollah Rahimi told state TV the flooding was under control and rescue and aid workers had been dispatched to the flood-hit areas.Kolivand later said one other person was also killed in Sarpol-e Zahab in the western province of Kermanshah.Authorities also have warned about possibility of floods in the capital, Tehran, as well as in the oil-rich southern province of Khuzestan in the next 48 hours.